2019 marks the 8th season of production at SkyRoot Farm! We are so excited to continue growing vegetables. Our farm is such a delightful place to be living and working. We are proud to be a part of your food system! 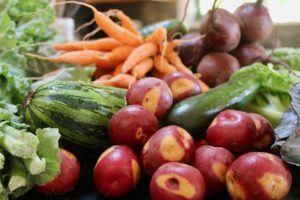 We are a Certified Organic Farm – and we want you to eat our veggies! You can purchase them at the Bayview Farmers Market, through our fresh sheet or by joining our CSA program! You can sign up for the 2019 CSA now! Find more details on our CSA page or go straight to the sign-up here. You can also find our produce at the Bayview Farmers Market all summer long! The market opens April 27, 2019. SkyRoot Farm practices are based on an ecosystem approach to land management and agriculture. Although veggies are our main focus, we are integrating animals into the farm: goats help push back the walls of blackberry to reclaim old fences, ducks control the slug population, and our poultry builds the soil and controls weeds. We build our soil so that it can support healthy crops. Your support — as a community member and customer — helps SkyRoot continue to grow dirt, plant veggies, and share them with you.